We have an excellent rail service along the Sefton coast, the Merseyrail northern line runs every 15 minutes in both directions between Liverpool and Southport. Northern provide the service between Southport and Manchester, stopping at Burscough Bridge which gives access to many of our visitor attractions. 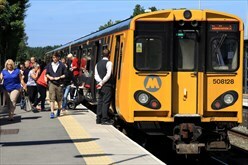 Merseyrail also provide a regular service between Sandhills and Ormskirk and don't forget that on the Merseyrail network you can take your bike along for free, without pre-booking, making your journey choice even easier. Have a look and see what wonderful things you can see when you take your bike with you on the train on the cycling routes page, lots of these routes can be accessed from railway stations too. If you intend to take your bike on any train, why not have a look at PlusBike. Available through the National Rail website, PlusBike is a one stop shop for information about your combined cycle and rail journey. You can access tailored information for your chosen stations including available cycle facilities / cycle hire / cycle carriage rules and also whether reservations are required.